Two-way syncing between ClickUp and your Calendar! Turning on this integration instantly syncs your ClickUp tasks with Google Calendar 📆. Update a task, and you'll see the change in Google. 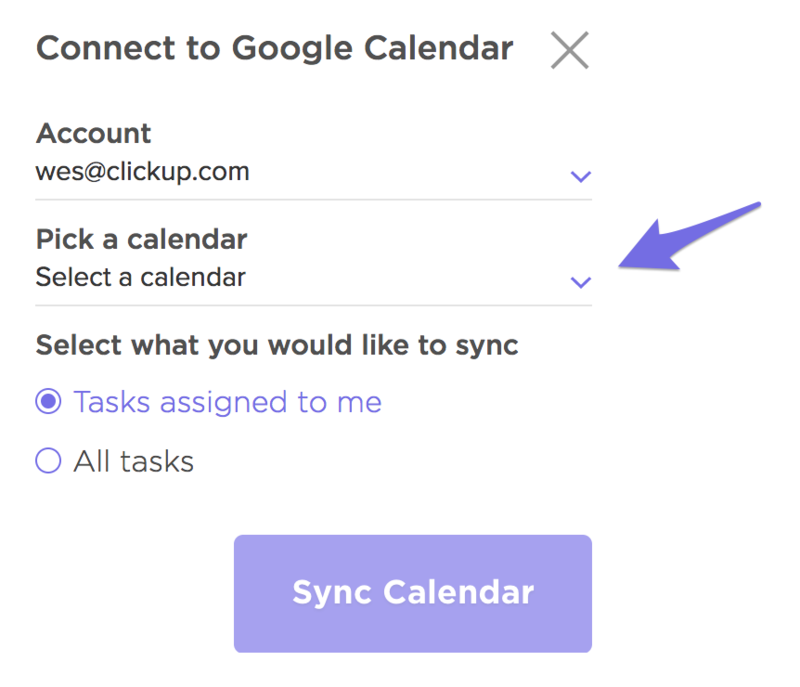 When you start the sync, any tasks in ClickUp will be added to your Google Calendar. You can then adjust task Dates/Times in Google Calendar. Changes made to pre-existing ClickUp tasks within your Google Calendar will be synced back to ClickUp. Task changes made within ClickUp will also be reflected within your Google Calendar. We keep track of any change to titles, start dates, & due dates. Seriously. You make the change, ClickUp does the rest. 2. Authorize a Google Calendar of your choosing. Choose Tasks assigned to me if you would only like to transfer tasks assigned to you. Choose All tasks if you want tasks for other team members. This latter option is ideal for managers. You can also drill into your hierarchy and only sync the tasks you want. If you would like to sync certain Spaces to a single Google Calendar, please first set up the integration for a single Space. Once you've saved that, set up another connection with the same calendar, but choose a different Space. If no start time is set, it will automatically be set to 12:00AM; likewise, tasks created in ClickUp with dates but not times will become "all day" events in Google Calendar. 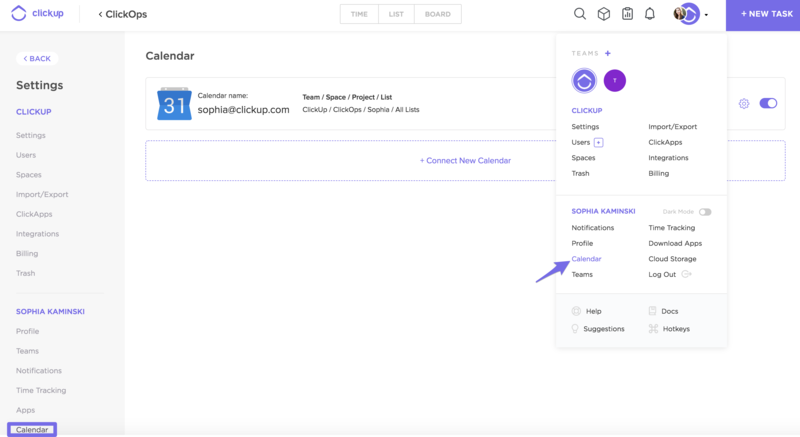 Tasks created in ClickUp will sync to Google Calendar; events created in Google Calendar will not create tasks in ClickUp. Tasks must have a start or due date in order to sync. Tasks without start or due dates in ClickUp will not be synced to Google Calendar. To ensure your most used Google Calendars are not booked by ClickUp tasks, we recommend creating a brand new Google Calendar to sync to. This is also great because you can quickly show or hide the new Google Calendar to reveal your tasks. Can I sync multiple ClickUp teams to one Google Calendar? Of course! You can sync as many Teams, Spaces, and Projects to your calendar (or calendars) as you like. What happens to closed tasks? Can they be removed from the Google Calendar? Not yet! But we are indeed releasing a new feature to give you this option. A more comprehensive doc on Google Calendar FAQs can be found here! Be sure to check out our scheduling and calendar features here!